‘But now, feeding raw – that is, feeding your dog hearts, necks, livers, kidneys, bones and muscle of animals such as chicken, lamb and rabbit – is becoming more mainstream. It’s a $100-million industry in the United States, and while there aren’t market figures available for Canada, the Canadian Association of Raw Pet Food Manufacturers says raw companies are multiplying rapidly, with some reporting a 30 to 40 per cent growth in business last year. It’s ironic that less-processed raw dog foods cost much more then cooked alternatives. Sometimes as much as double the price. 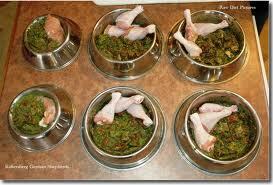 I suspect the raw dog food trend is driven by people looking for a more ‘natural’ lifestyle for their dog. There are some genuine benefits in raw diet – one advantage is that these diets tend to be less grain-based then the regular dog food (but check the ingredients). One obvious draw back is the shorter shelf-life. I personally do not believe that just by the virtue of being raw a dog diet is better. Incidentally, viewing dog food from the view of Chinese Medicine – young dogs would be better off with raw diets and older dogs would benefit from having their food cooked.